A pair of programming providers get into a very public spat about who’s to blame over the substandard service subscribers are receiving. Fingers are pointed. Threats are made. And at the heart of the dispute is little more than cold, hard cash. No, I’m not thinking of the barbs that Netflix and Verizon traded late last week over the latter’s delivery of the former’s streaming video service—though I very well could be. In this case, I’m referring to last summer’s ugly feud between CBS and Time Warner Cable. 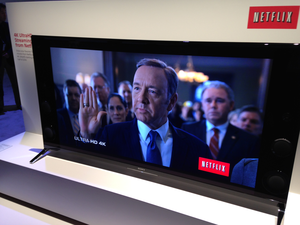 Who’s to blame when that House of Cards episode isn’t smoothly streaming into your home? Netflix and Verizon would like you to know it’s the other guy’s fault. That may sound terribly familiar to Netflix subscribers who get their Internet from Verizon. Last week the streaming media service started displaying messages when streaming slowed, blaming Verizon’s network for the low video quality. Verizon is now threatening to sue Netflix if the messages persist. Like the CBS-Time Warner Cable dispute, this Netflix-Verizon dust-up is one of many content provider/content distributor battles springing up in the digital world. And the bottom line is the same, too: It all comes down to money. They probably don’t say that last part out loud. The rub: Neither side in this debate wants you to blame them should your stream of Orange Is the New Black start to lag. Because that could cost them subscribers, which ultimately costs them money. This is a dire fiscal fate that Netflix, Verizon, and Comcast (another ISP whose disputes with Netflix have gone public) all want to avoid. At least they agree on that issue. “But what about the technical question of who’s responsible?” the geekiest of you may ask. The answer: Ultimately, they all are. If Netflix, Verizon, and Comcast were first and foremost concerned with delivering a top-notch streaming experience above all else, they’d probably be working to make it happen—not throwing sanctimoniously-worded temper tantrums blaming each other. Updated at 11:30 a.m. PT to note that Netflix plans to stop posting on-screen messages about streaming performance.